The following article contains a few highlights from an unpublished paper entitled "Pioneering in Western Canada" by Jessie (Boulton) Mann, Biggar, Saskatchewan. My father, Tom Boulton, came to Manitoba in 1870 and served as a spy for Colonel Garnet Wolseley during the Red River Rebellion. His particular assignment was to keep an eye on the Indians for any signs of unrest, but while carrying out his military duties he became a trusted friend of the Indians, and his winning ways and regard for the native people earned him a safe passage among them. Tom rode an Indian pony, a small cayuse, and used an English saddle. He carried a pistol, cartridge belt, ammunition, knife, cooking utensils, and a blanket. He had no tent and slept in the open, using his saddle as a pillow, the prairie as a bed, and when dust storms raged, he pulled the blanket over his head to ease his breathing, and in the morning swept away the sand that had drifted over the blanket during the night. The army ration for a mounted spy (scout) was meagre, bannock and salt pork, but there were lots of prairie chickens and ducks, and the latter, after they had been drawn, were encased in clay and set in hot embers. When they were done, the baked clay would be broken away, taking with it the feathers and leaving behind the clean, skinless meat ready for eating. Tom had more than one encounter with prairie fires, but always made a safe retreat to a lake or slough where he waited in the water until the flames had roared by. He said that the Indians, when pressed by a prairie fire, would rush for the nearest water, soak their robes or blankets, then place them over their heads and shoulders and remain in the water until the inferno had passed. After the trouble at Red River was over, Tom Boulton returned to England, but the prairies were in his blood and he came back to the west in 1872. On December 1 of the following year he purchased the S.W. ¼, 4-4-6 at $1.00 an acre under the Military Bounty Grant. On February 7, 1876, he purchased the adjoining quarter section (S.E. 4-4-6). 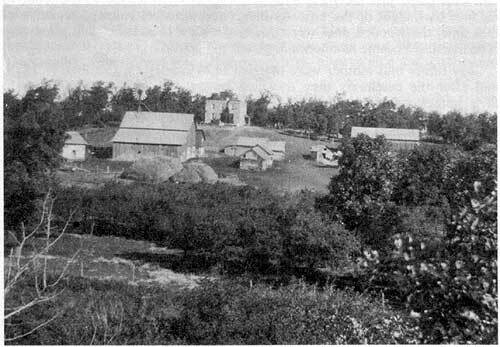 This land was situated in bush country, eighty-seven miles southwest of Winnipeg and about three miles east of Pembina Mountain. Silver Creek ran through the property. The first home he built was a slant-roofed log shanty, the front side being about seven feet high, the back side being about five feet high, and built a little way into the side of a hill. I remember this shanty well. It had just one window and one door, and in later years it was used as a shelter for the ewes and their lambs. Our second log house was a one and a half storey dwelling, with a large lean-to kitchen. The floors were made of oak, eight inches wide, obtained from the sawmill at Nelson. There was a stone fireplace in the kitchen and another in the front-room. I can barely remember these fireplaces; only one little incident bringing them to mind, and that was when dad carried me out of my sick bed and placed me before the frontroom fireplace, after a bad dose of red measles. "In 1898-90, Tom Boulton built a two-storey stone house ... All the stone for this building was gathered on his homestead and pre-emption land." Source: Mrs. Jessie Mann, Biggar, Saskatchewan. "It was always a pleasure to see the sheep and lambs feeding in the pasture ... They kept the grass cropped close, just as if clipped by a modern lawn mower." 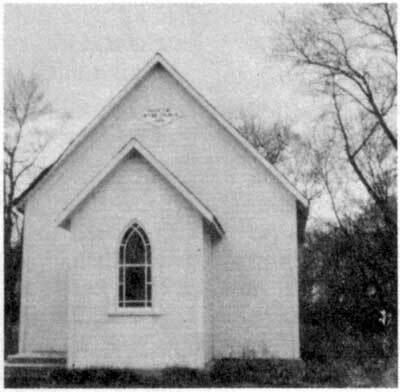 In 1898 and 1900, Tom Boulton built a two storey stone house, 30' x 30', with a lean-to kitchen and wood shed, 14' x 24'. 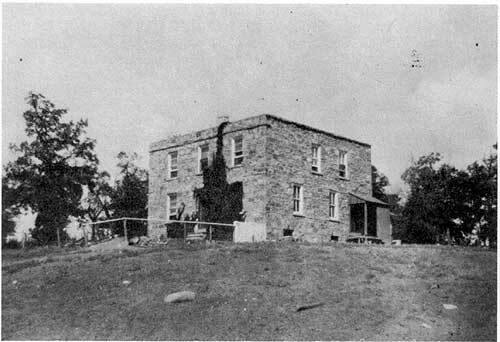 All the stone for this building was gathered on his homestead and pre-emption land. This dwelling was a square-style English house, with a full basement. It was heated by a large furnace, which to begin with was fired with heavy oak stumps and later with coal. There was a stone storage room for vegetables, a stone cistern for soft water, with a brick filter, and a room for fruits and pickles. It was in this room that we turned the old fashioned ten gallon barrel churn, one churning making about ten to fifteen lbs. of butter. The buttermilk was fed to the pigs. This house was one of the first rural homes to have acetylene gas for light. A big pressure tank in the basement, with water in it, was fitted with a gauge; the carbide was in a five gallon drum. I do not remember how this system worked, but a combination of calcium and water produced an illuminating gas. We used this system for two years, but when we heard that the same type of system had blown up in a hotel and destroyed the building we did away with it and reverted to the old coal oil lamps. I always enjoyed our coal oil hanging lamp, which was suspended above the dining room table. It could be raised or lowered by a chain which rolled into a coil at the ceiling. It had a beautiful pale pink shaded glass globe, with a painted rose on it, also another on the base. The shade was encircled by a fancy brass band from which hung bangles. Tom's great interest was raising sheep from well bred Oxford and Shropshire strains. 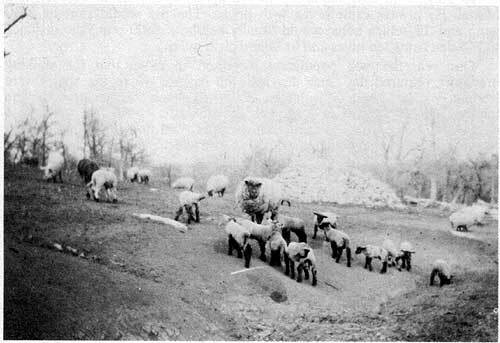 Sheep were economical to raise; their winter feed, green pea vines and oats mixed, being the kind of fodder that cattle and horses would not eat. In July, Tom took his sheep to the agricultural fairs at Morden and Miami. He always came home with prizes. The trip would start at 3:30 a.m., and the return home would usually be about 8: 00 p.m., the distance to Morden being ten miles and to Miami eight miles. One year the wolf population increased so much that the stalking predators ventured day after day into the pasture where the sheep were feeding. We lost some little lambs. So, since I was the youngest in the family, and not needed to help with the domestic work, Dad thought I should stay home from school, watch the flock, and keep the wolves away. If a wolf saw a human being he would run away very quickly. So in the cool spring weather, if you can picture me sitting on the side of a hill and doing embroidery work, I would keep watch over the flock. I did a very fine linen workbag in punch work while I watched those sheep, and when I look at it now, I wonder how I had the patience to do such fine work. Every year there were one or two lambs that the ewes would not care for. So it fell my lot to feed them cows' milk in a bottle. Two especially, Bobby and Mary remain in mind, for all I had to do was to call their names and they would come running and jumping for their bottle, their little tails wagging merrily behind. How they thrived on cows' milk. It was always a pleasure to see the sheep and lambs feeding in the pasture in the shade of the big oak trees. The sheep kept the grass cropped close, just as if clipped by a modern lawn mower. The lambs would gather in groups and race down the hill and back again. Only those who have seen them in action can ever grasp their vitality. "Our second long house was a 1½ storey dwelling, with a large lean-to kitchen. The floors were made of oak, eight inches wide, obtained from the sawmill at Nelson. This house is seen on the hill (right background)." "The stone house on the hill; barns, pens and sties in the home pasture, and the beautiful trees all around. Photo taken in 1911, the year Tom Boulton died." My father used to walk through the thick stands of elm, birch, oak and maple and select suitable wood to make single-trees, double-trees and tongues for his horsedrawn vehicles. He cut branches suitable for axe handles and would always have a plentiful supply of these on hand. He also kept a good supply of oak timbers and fence posts in reserve for immediate use if needed. He did his own blacksmithing on a homemade forge, heating and shaping the precious iron thereon, for iron was very scarce in those days. The interior of our stone house and the foundations of the barns were plastered with lime, the limestone being dug on our own farm and reduced in a kiln, which was simply a deep ditch dug in the side of a hill, over which an iron grate was held up by stones. The heat from heavy oak blocks crumpled the limestone, and from the "ash" lime was made. The interior walls of our home, plastered with this lime, were shiny white and smooth as glass. As wires and staples were things of the future, Tom built his own rail fences from poles hewn on his own land. These were rickrack fences, layed in the shape of a V, alternatively, with posts driven into the ground at the point of the V's to secure them. This type of fence was strong enough to contain cattle, horses, pigs, and sheep. The first vehicle my father built was a one-horse jumper sleigh, with low runners about a foot high. These were made from carefully selected oak which had just the right natural curve to form angles at the front to balance the height of the box. As there were no steel runners available at that time, the wooden ones were trimmed with a drawknife, and after very little use they became as smooth as glass. My father and mother were married in Winnipeg on October 6, 1879, and after the ceremony they travelled by ox cart, eighty-seven miles to their homestead, where William Crane, a neighboring farmer, had faithfully cared for the stock during father's absence. Mother had come out from England on her own to marry her childhood sweetheart, but somewhere en route her two cedar chests, containing her lavish wedding gown and distinctive trousseau, went astray. So she was married in the suit she wore while travelling. In due time the cedar chests arrived intact with the lovely wedding dress therein. It was made of silver and green striped taffeta, to be worn with kid shoes, Romeo design (no heels), and matching white kid gloves of very select quality. In these same chests were six lovely handmade cotton nightgowns, hand embroidered edging, with every stitch finely sewn. I have never seen anything to equal the cherished nightgown I inherited from this trousseau of my mother's. Typhoid fever struck our family when I, the youngest, was only nine or ten months old. All the family except me was struck down by this dread disease. Mother took it last, and she and my second oldest sister, Ella, were taken to the Free Masons' Hospital at Morden, which was built in 1892. Mother was the last to be stricken, and, after nursing the rest of the family, her resistance was gone. She died on Christmas Day, 1893, and was buried in the little cemetery at Nelson, where her second oldest child, a baby, was also buried. This cemetery is located on the sand ridge of the Jim Duncan farm, about two miles from the Nelson townsite and one and a half miles from our home. "When the Methodists and Presbyterians united, services were held in the Methodist Church (Dunston United) - the only public building still standing at Old Nelson." About a year after mother died, father secured a very efficient housekeeper, Emily McCollough, a sister of John A. and Oscar McCollough, of Miami. She stayed with us for thirteen years. On cold and stormy days when it was not possible to get to school because of snowbound roads, she would set my brothers to hooking rugs, which were made from thin strips cut from discarded clothing, most of which (all the woolen material) being made from wool from our own sheep. The girls were taught how to sew and make quilts. I think our housekeeper could do almost anything. She was a wonderful cook, and could make the best bread out of hop yeast I have ever tasted. And her vinegar for making sweet pickles was better than any manufactured variety. During the summer she made root beer and cider in ten-gallon kegs. These non-alcoholic drinks, always nice and cool, were kept in our stone basement. Homemade soap was Emily McCollough's professional hobby. She made the lye or leach by putting wood ashes in a barrel which had holes all around and up and down its slats. This was placed over a vat, usually a big iron pot, then water was poured on the ashes. The fluid mix ran into the pot and this formed a leach to which was added clarified beef fat, all of which was mixed and boiled together. The liquid soap was poured into wood molds and there it stayed until it hardened. Then it was cut into squares and stored in a cool place. In 1874 many settlers came to our district and took up homesteads, and at a place where the first post office was located, on the corner of the A. P. Stevenson farm, a new village named Nelson, after Adam Nelson, a pioneer settler, was established. 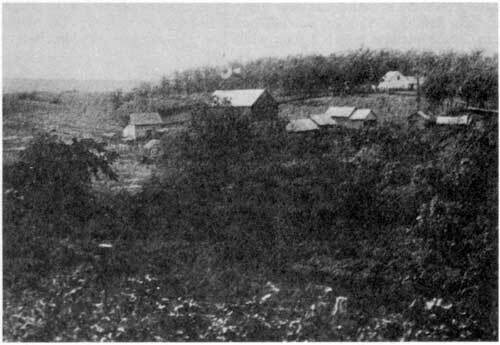 This place, later to become Nelsonville, to distinguish it from Nelson, British Columbia, was abandoned when the railroad bypassed it. In the summer of 1958 a cairn was erected on the old town site of Nelson in memory of its pioneer citizens.